Lincrusta wallcoverings are a fantastic way of adding a gorgeous interior design element to the walls of your home. A classier alternative to traditional wallpaper, with a huge variety of designs and patterns to choose from. 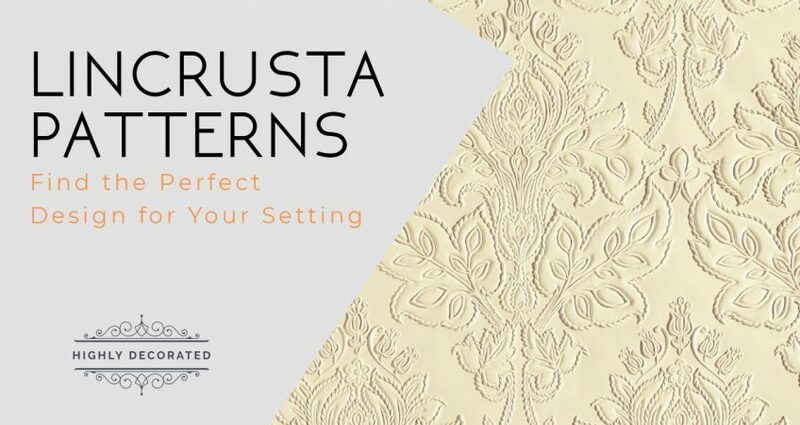 At Highly Decorated, we’ve got a massive selection of Lincrusta patterns to choose from. So much so that you’re certain to find the perfect design for your setting. The tapestry wallcovering will transform your home with a real authentic style from the Art Nouveau period. Drawing on design inspirations from the 19th Century, this is ideal for a large dining/living room setting. The textured look and intricate floral patterns are perfect for an old Victorian home looking for a design refresh. If you’re looking for a truly luxurious wallcovering, then fanfare surely catches your eye. The design is very elegant and artistic, making it suitable for many interiors. We recommend this for a bathroom remodel as it adds a touch of class to one of your homes sacred places – even better if used in an en-suite. Chequers is a fine example of when a simple design can be made into something magnificent. This wallcovering is made up of lots of tiny squares, providing a very unique look and texture to your interior walls. The beauty of this is that so many different paint effects can be utilised here, making it perfect in a modern interior design setting. This wall covering design is very unusual but provides something different for your interior. It gives a sense of energy to your room, and the patterns are vibrant and beautiful. We think this goes perfectly in a modern living room as it helps breathe life into your setting. The fantastic thing about Neo is that it blurs the lines between traditional and contemporary interior design. On the one hand, the patterns will compliment a very modern looking setting. On the other, it has a very vintage look that won’t look out of place in a home following a more traditional interior design. A great idea for modern dining/living rooms, or the perfect backdrop in a more traditional hallway. Crichton is the epitome of modern wallcovering design. It features vertical stripes that vary in size and thickness, creating a really textured look on your walls. Many people use this in a bedroom on its own to add some life to the place. However, it can also be used in conjunction with a traditional design like tapestry, for a contrasting effect. This wallcovering takes inspiration from the iconic Malaysian interior design scene. Therefore, it’s perfect if you’re modelling your home full of ideas from Southeast Asian culture. However, it also happens to look gorgeous in almost any setting you can think of. It perhaps leans towards modern interior design more than traditional, and we think it looks perfect in your hallway. Linenfold is a fantastic wallcovering if you’re not trying to make a statement. The pattern is very subtle, and it almost gives off a wooden quality. We believe this is the ideal wall covering to complement any modern space. Especially if you have laminate or vinyl flooring, and some contemporary wooden furniture to complete the look. If you’re after a majestic design straight from the 18th Century, then this is one of your best options. It’s ideal in your hallways, or on the wall going alongside your staircase. Will turn any home into a Georgian manor house that exudes class and excellence. We also think it’s excellent in a master bedroom to really bring out a traditional design. Seagrass matting is certainly not for the faint-hearted. It’s a real statement design, with the unique texture and design more often found in flooring than on your walls. However, there’s a softness to it that makes this design absolutely perfect for your bedroom. It can be made to look modern or traditional too, depending on your preference. Some people like to use the wallcovering to create a feature of sorts on their walls, but we think it looks best when used from top to bottom, side to side, adding a beautiful pattern to your bedroom setting. The inspiration for this wallcovering design lies all the way in the 16th Century. It has very elaborate patterns and carvings, making it look like it’s come straight out of the set of a period drama on TV. It’s bold and beautiful, making this a must-have for any homes following a classic interior design style. This is another wallcovering with a design that involves plenty of intricate floral patterns. It’s something that’s almost destined to feature in old Victorian style homes. We think it’s great for your living room or dining area, particularly when complemented with big leather armchairs or oak furniture. There’s something about Amelia that just makes it a very elegant wallcovering. The details are so precise and exquisite – it’s a really traditional design that works exceptionally well in bathrooms. However, this wallcovering also looks gorgeous when colour is added to it, making it great for both classic and modern looking homes. Adding the Elizabeth wallcovering to your home can make it feel like a royal palace straight out of 16th Century England. The design is big and bold, with different colours taking it to new levels. It’s an ideal replacement for wallpaper in your entrance hallway, but can also be used as big feature in your bedroom. Perfect if you’re looking for a ‘grand’ interior design choice. This is a design that doesn’t just work on your walls but can add something extra to your home when used on the ceiling too. It’s a very historical design that’s absolutely dripping with heritage. For this reason, we don’t think it fits well in very modern and futuristic looking homes. Use on your walls to bring your living room to life, or perhaps add a more vintage look to your kitchen when placed on the ceiling. Byzantine is taken straight from the 1800’s and features a very eye-catching design. The pattern isn’t too large or small and gives off an almost mosaic effect to your walls. It’s perfect in an entrance or upstairs hallway, lining the walls of your house with a very specific style. Again, this one is ideal for more traditional homes looking to spruce up their classic interior design style. The pattern in this wallcovering is largely made up of twisted corded strands. This creates a very unique look, and almost adds softness to any room. There’s so much detail in this pattern, and we believe it goes perfectly in your bedroom. The soft looking texture combined with the very simple design makes for a cosy atmosphere. The Kelmscott wallcovering is very decorative and features big floral patterns with a lot of curves and swishes. Different colours can be used to help compliment your interior design, but this covering really suits classic walls. Use it if you want to create a sense of grandeur in your home. This wallcovering takes massive inspiration from one of the biggest periods in world history. The Italian Renaissance has a very specific design, and this wallcovering is naturally perfect if you’re trying to create the renaissance design in your home. It’s very much a statement piece, so perhaps any of the minimalists out there should stay away. Passeri is yet another statement piece that’s not for anyone trying to keep things simple in the home. It features a grand design that’s very ornate and gives a classical feel to your home. You almost get the sense of being inside an old French chateau when you use this wallcovering. While it can most definitely be used in many rooms, there’s no better place for it than the bedroom. Especially when complemented by a big statement bed, and plenty of traditional furniture. Taking its name from one of Egypt’s iconic rulers, this design screams pure beauty. It’s quite similar to the Italian Renaissance design but works very well in different colours. In fact, if you use certain shades of paint, you can almost downplay the pattern a bit, making it more subtle and less of a statement piece. Perfect anywhere in the home, but perhaps best suited to a study or personal library area. Another design that’s similar to Italian renaissance and Cleopatra, this one takes onboard some iconic style cues from Ancient Greece. The swirls in the patterns are absolutely breathtaking, and it creates a very traditional look. Would be ideal as the backdrop in a large bedroom with some antique lamps on a classic bedside table. With this wallcovering, you have a pure beauty that radiates throughout whichever room it’s in. The design is very feminine and floral, meaning it’s another great option for bedrooms. We also think it looks perfect in your living area if you’re trying to create a very bold and classical interior design. So, which wallcovering is right for you? There are many different designs to choose from, each one offering you something different. Regardless of whether you’re a minimalist, looking to make a statement, or focusing on modern/classic interior design; there’s a Lincrusta pattern out there that’s perfect for you.